India's largest consumer e-commerce firm Flipkart Online Services Pvt Ltd, which runs Flipkart.com, has finally made its marketplace official. While a sign-in page for existing sellers has gone live at Sellers.flipkart.com, businesses have to mail the company at vendor@flipkart.com to receive new seller invitation. According to the limited information currently available, once they have signed up, sellers can choose to feature their own products or select from Flipkart's existing catalogue of products. Although the firm has not clarified whether the marketplace will be integrated with the existing site, the company might be looking at that. If Flipkart, indeed, follows that model, it will be similar to Amazon. The world's largest e-tailer also gives the option to consumers to buy the same product either from Amazon or from different sellers. As of now, the 'Marketplace' banner is linked to the parent site. We have asked the company for more information on the same and will update the story as and when we receive it. The logistics will be handled by Flipkart's logistics partner, according to the vendor registration page. 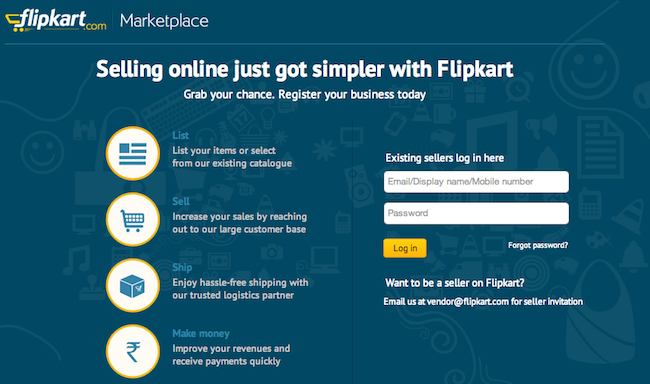 Medianama first reported that Flipkart has started accepting proposals for adding vendors to the marketplace. For those who are not familiar with the business model, let us clarify that an online marketplace allows brands and/or retailers (offline) to create their own e-commerce stores using the company's portal, Ã la eBay. There are two ways of doing it, though. One is how eBay does it "there every buyer knows from which vendor he/she is buying. Or it can be done through a model used by Snapdeal where the consumer interface does not suggest it is a marketplace as orders are managed at the backend and vendors' names are not displayed upfront. In September last year, we had reported that Flipkart had registered two new companies in India called Flipkart Marketplace Pvt Ltd and Flipkart Payment Gateway Services Pvt Ltd. While Flipkart Payment Gateway Services was incorporated on August 31, 2012, Flipkart Marketplace was formed just 12 days later â€“ on September 12. At that time, we had mentioned that the company was planning to launch its own online marketplace business. Although Flipkart has not disclosed a launch date or details of the business model, its spokesperson said, "We are continuously trying, testing and exploring multiple initiatives and it will be too early to comment now. As and when we are ready with any offering, we will definitely come back to you." According to an earlier NextBigWhat story, the launch may happen in March 2013. The report also stated that the company would charge businesses a fee of 6-10 per cent for selling products on its platform, as against the industry average of 12-15 per cent. While the jury is out on what is the better way to do e-commerce, a lot of inventory-led e-commerce companies have been moving to the marketplace model as it helps control costs in an otherwise high cash burn space. While some choose a hybrid model of holding an inventory and running a marketplace, others simple choose the 100 per cent marketplace model. Like any other marketplace, it enables offline sellers to offer a much wider basket of products (much more than what it can stock on its own). Also, customers can choose from a number of sellers, on the basis of different variables (like delivery time, price, warranty, etc.). Flipkart already has a strong logistics setup and is a prominent name in e-tailing business, driving traffic to its site, which will help boost customer confidence in the upcoming marketplace. A number of e-commerce companies in India are already offering similar services. Tradus.com (which has common investors with Flipkart) has also launched seller storefronts that allow wholesalers and distributors from across the country to sell directly to consumers. ShopClues.com is another managed marketplace. E-commerce firm Snapdeal.com had previously transitioned from a pure online deals site to a full-fledged horizontal e-commerce company via a marketplace model. It now claims to be the country's largest e-commerce marketplace, doing a projected annual gross merchandising volume (GMV) of $300 million this fiscal, and is aiming to achieve $1 billion in GMV by 2015. In December last year, BuyThePrice.com, an e-commerce site owned and operated by MyZingo eCommerce Service Pvt Ltd, also pivoted from a pure e-commerce site to a 100 per cent marketplace. Flipkart earlier (in August 2012) raised an undisclosed amount in its Series D round of funding from existing investors Tiger Global and Accel Partners, as well as from two new investors â€“ MIH (part of the Naspers Group) and ICONIQ Capital. Prior to that, it had raised $31 million from Tiger Global Management and Accel Partners, besides a few angel investors. Also note that currently, the enforcement directorate (ED) is probing the firm for possible violation of foreign direct investment (FDI) norms, since FDI in e-commerce has not been approved in India (read here and here for more on that). Earlier this week, Karandeep Singh, the chief financial officer of Flipkart, left the company owing to personal commitments. Singh has been with Flipkart for just over a year.